A major roadblock to developing drugs is the fact that crypto oocysts—the infectious form of the parasite that thrives in the small intestine—are impossible to cultivate under laboratory conditions, explained Saul Tzipori, distinguished professor of microbiology and infectious diseases at Cummings School, who has made the study of crypto and other intestinal diseases his life's work. "To evaluate and optimize prototype vaccines and test them in humans we need to use the same source, age, viability, quality, and quantity of oocysts. This is impossible with available methods, which necessarily involve variation," said Tzipori, who is also the Agnes Varis Chair in Science and Society and chair of the Department of Infectious Disease and Global Health. For the past forty years, scientists have tried to keep crypto oocysts for later use by freezing them—a process called cryopreservation—using slow cooling, "but those methods didn't yield infectious oocysts," explained the paper's co-first author, Justyna Jaskiewicz, a veterinarian who is pursuing a Ph.D. in biomedical sciences as a member of Tzipori's lab. The group discovered that the oocysts' impermeable walls kept out cryoprotective agents—chemicals that are typically used to prevent formation of harmful ice crystals by replacing intracellular water. As a result, sharp ice crystals formed, which punctured and damaged the oocysts' infectious interior. To help tackle this problem, Tzipori's team tapped the expertise of Massachusetts General's Center for Engineering in Medicine, whose co-founder, Mehmet Toner, is widely known for advances in low-temperature biology and tissue stabilization. "Unlike standard cryopreservation, where cells are slowly cooled, our technique vitrified the oocysts almost instantaneously. 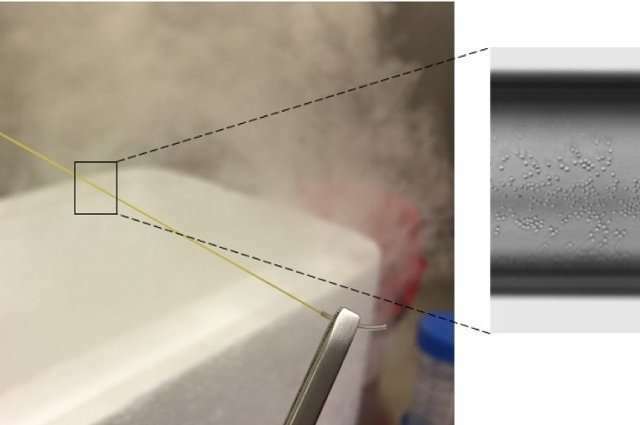 Vitrification is an ice-free method that cools cells so rapidly that crystals don't form," said Rebecca Sandlin, an investigator at the Center for Engineering in Medicine and co-first author on the paper. The discovery is just the latest from Tzipori's far-ranging research on a host of globally important infectious diseases, from E. coli to dengue fever. "For the first time, we can produce the crypto parasite—including unique or genetically modified strains—in large quantities, without need for constant passage through animals, uniformly cryopreserved, and ship it to other investigators in liquid nitrogen that can be stored indefinitely and used at any time," he said. "This capability has existed for other pathogens, but never for crypto."